Tomic and Popyrin were on a collision course to meet in the second round of qualifying at the ATP Tour's Indian Wells Masters in California. While Popyrin progressed with a routine 6-3 6-3 win over Slovak Jozef Kovalik, Tomic was unable to keep up his end of the bargain, falling 7-6 (7-5) 2-6 6-3 to Czech Lukas Rosol in his first outing since withdrawing from last week's Mexican Open in Acapulco. Popyrin, selected in Lleyton Hewitt's Davis Cup squad last month just a fortnight after Tomic's blistering attack on the Australian captain, will instead face Rosol in the second round of qualifying. 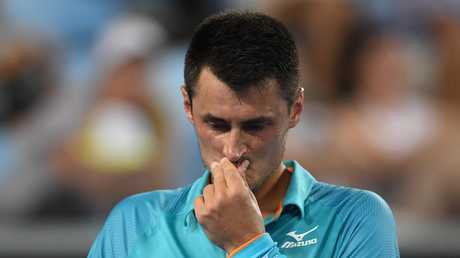 Tomic was scheduled to play Popyrin in the final round of qualifying in Acapulco but forfeited. Fellow Australian Alex Bolt also edged closer to a main-draw berth with a 6-4 7-5 first-round qualifying win over Italian Gianluigi Quinzi. Popyrin and Bolt are hoping to join countrymen Alex de Minaur, Nick Kyrgios, John Millman, Matt Ebden and Jordan Thompson in the main draw of the Masters 1000 event. As seeds, de Minaur and Kyrgios, last week's winner in Mexico, both have first-round byes. De Minaur will open against either Frenchman Jeremy Chardy or a qualifier, while Kyrgios will play German Philipp Kohlschreiber or Frenchman Pierre-Hugues Herbert, with world No.1 Novak Djokovic likely to be waiting in the third round. Millman will face German Jan-Lennard Struff in the first round, Ebden has drawn veteran Croat Ivo Karlovic and Thompson's opponent will be Argentine Federico Delbonis. Bidding to join fellow Australians Ashleigh Barty, Ajla Tomljanovic, Daria Gavrilova and Samantha Stosur in the women's singles main draw, Priscilla Hon beat Czech Veronika Kudermetova 6-4 6-2 in her first-round qualifying match. Seeded 12th, Barty will enjoy a first-round bye before opening her campaign against either German Tatjana Maria or Slovakian Magdalena Rybarikova. Tomljanovic begins against Frenchwoman Alize Cornet, Gavrilova faces Ukraine's Dayana Yastremska and Stosur squares off with American wildcard Madison Brengle.